Mentioning that there is no scope to go beyond the Constitution over the next general election, Health Minister Mohammed Nasim on Tuesday said no conspiracy to thwart the polls will work. “The election will be held as per the Constitution. A quarter is hatching conspiracies in the name of an alliance to thwart the election. However, no conspiracy will be of use,” he said while talking to reporters after visiting 20-bed Jinjira Hospital at Keraniganj in Dhaka. Claiming that the country sees development when Sheikh Hasina is in office, Nasim said the Awami League government will have to be voted to power again for the sake of development. 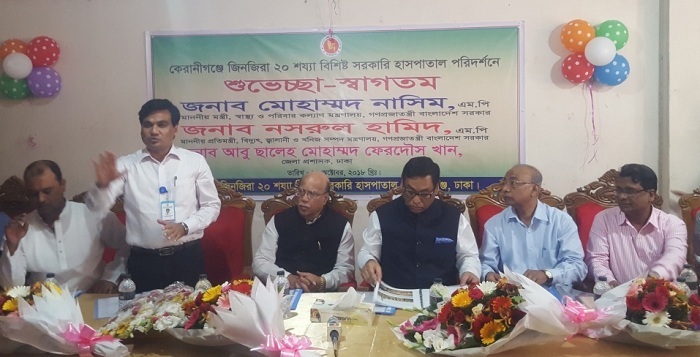 State Minister for Power, Energy and Mineral Resources Nasrul Hamid, Deputy Commissioner of Dhaka Abu Saleh M Ferdous Khan and Keraniganj upazila parishad chairman Shahin Ahmed were present on the occasion.